Ok, I know that the month is almost over but these are the books that I have managed to read over the past 3 weeks. I'm currently reading "The Audacity of Hope" by Barack Obama. I know, I'm late picking this one up, but so far, I have found it to be a great read. Most books that I purchase are leisure reads. I pick up a finance journal every once in a while because what I have found it is repetitive information and is catered more toward the general public. I am glad there is a lot of published material because it doesn't do any justice to work and not know what to do with your money or know where it is going. I have an iPhone and I downloaded the Checkbook application ($1.99 when I purchased it) and you can keep track of your balance at all times! I do not believe in paying a bank to hang on to my deposits either, so you better believe I have free checking! I could go on and on about finance, I was a finance major and graduated with a BSBA but this is supposed to be about my bookshelf...speaking of which, I won't post a pic of it because you all would be like omg, are you like, the library? I have a ton of books, but should we happen to read the same books in the future, please, feel free to post your comments and discuss!! I'll post when I get ready to place my order at Amazon.com so that you know what I am going to order. 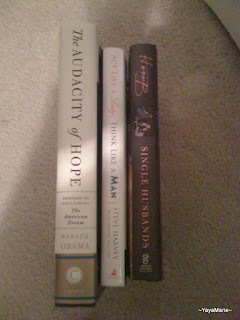 Here is the list so far... http://good.ly/ajhdmq (This book was released Tuesday, I'm going to BooksAMil this Tuesday to see if I can get a copy), http://good.ly/aoxk24 (PreOrder 7/28) , and http://good.ly/awr8pa (PreOrder 8/25). Generally, I do not order from bookstores because I prefer hardcover books and when you order from a warehouse you can get the book at discount. Besides when you order online you save yourself the disappointment of going to the bookstore and they are sold out. I usually get my books within 3 days of ordering from Amazon. Not bad.